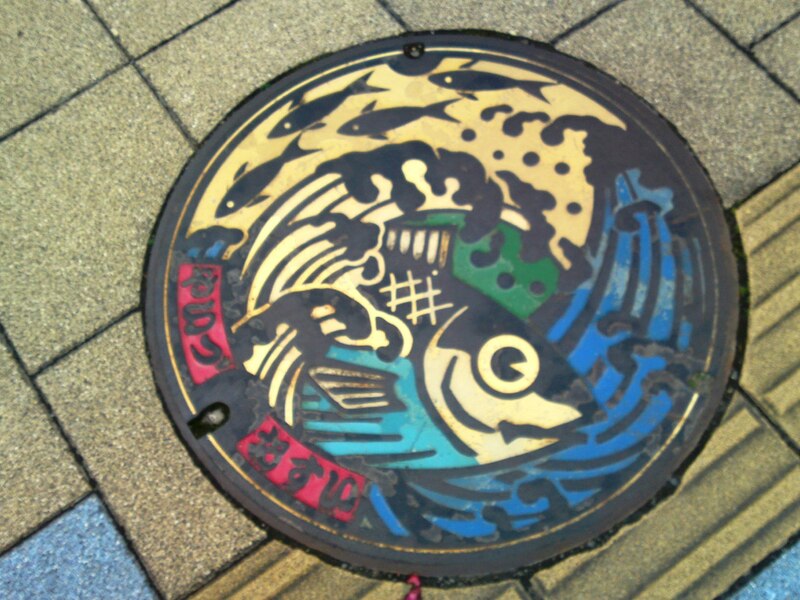 Japan Urban Art: An Introduction to Manhole Covers-Drain Spotting! 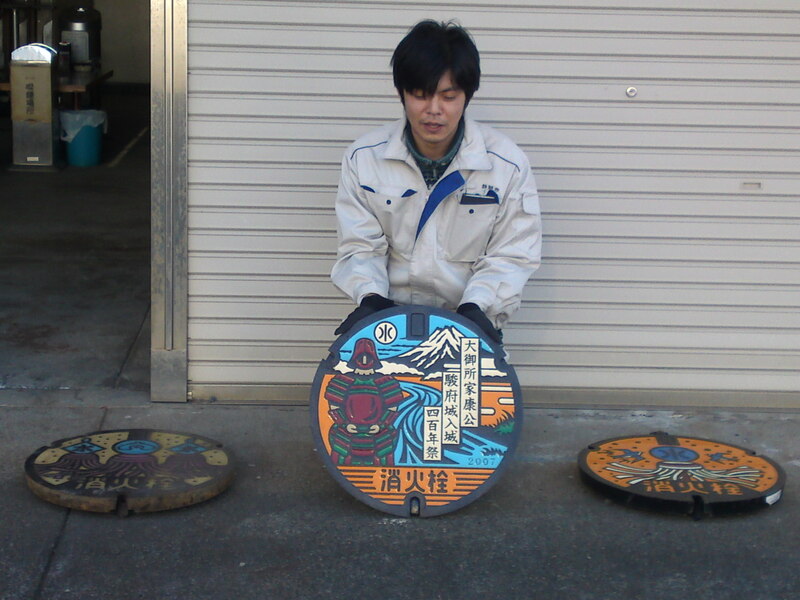 Fire hydrant manhole covers at Shizuoka City Waterworks center! 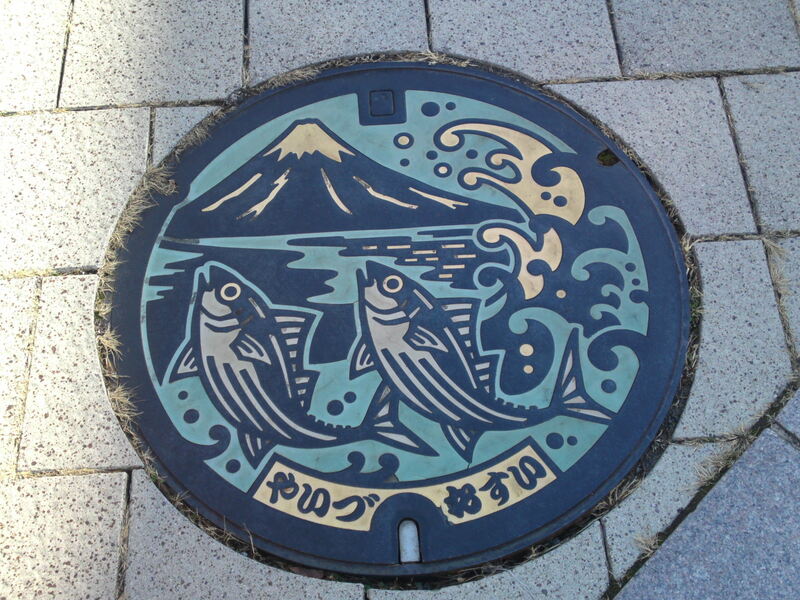 Tourists and expat residents alike are always surprised to discover artistically designed manhole covers of all kinds as the walk urban streets and even villages lanes, a rare sight away from Japan where they would probably be quickly stolen in spite of their weight in any other country! 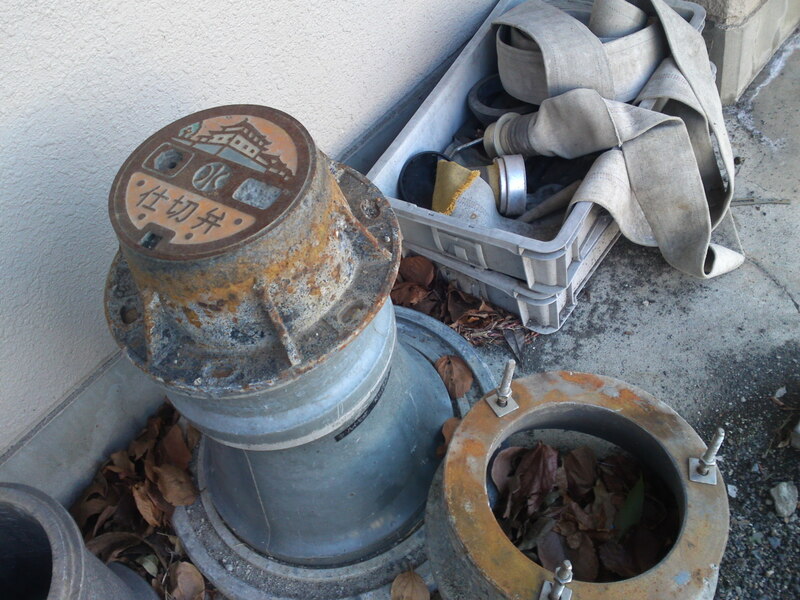 Replacing a fire hydrant manhole cover in Shizuoka city! 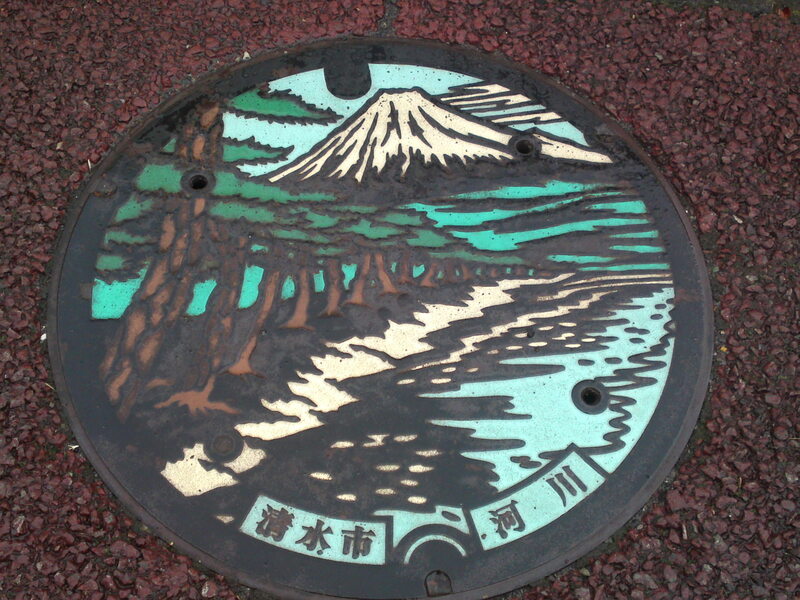 Sewer networks had long existed in Japan until foreign engineers introduced modern underground sewer systems with above ground access points called manholes in the 19th Century. Such manholes had to be covered for obvious reasons, hence the name of”!manhole covers”! 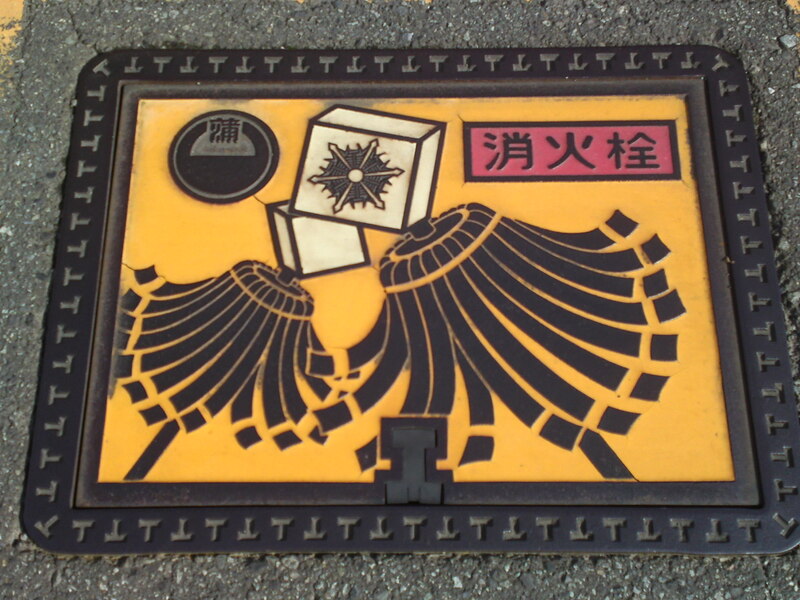 Their geometric designs were not that remarkable until a momentous event took place in the 1980’s when the Japanese Government slated to have not only cities but all communities to be equipped with new sewer systems to enlarge streets and pavements and facilitate movement and access as they also implied the disappearance of above ground fire hydrants. 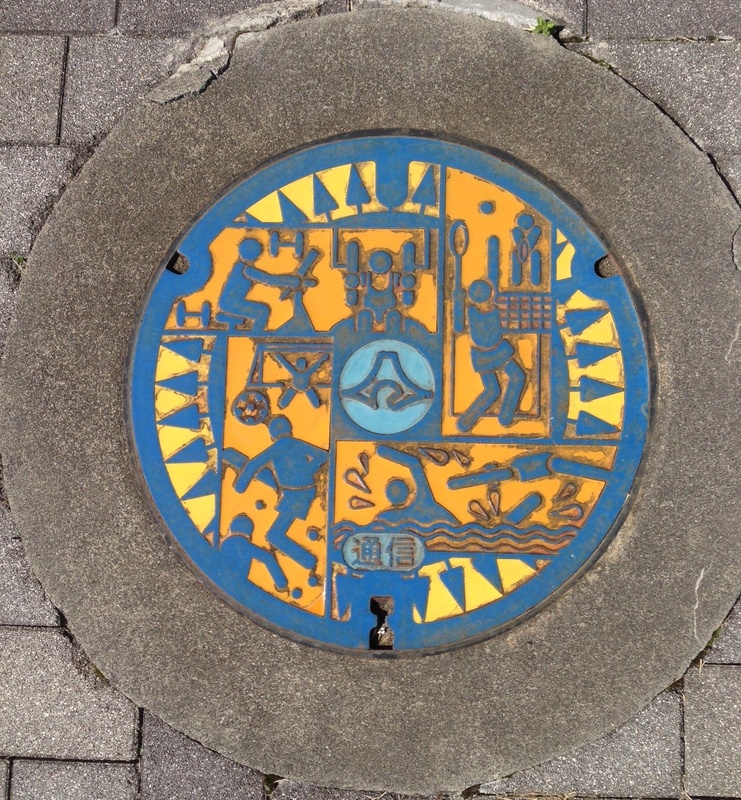 Fire hydrant valve manhole cover devices in Shizuoka City! 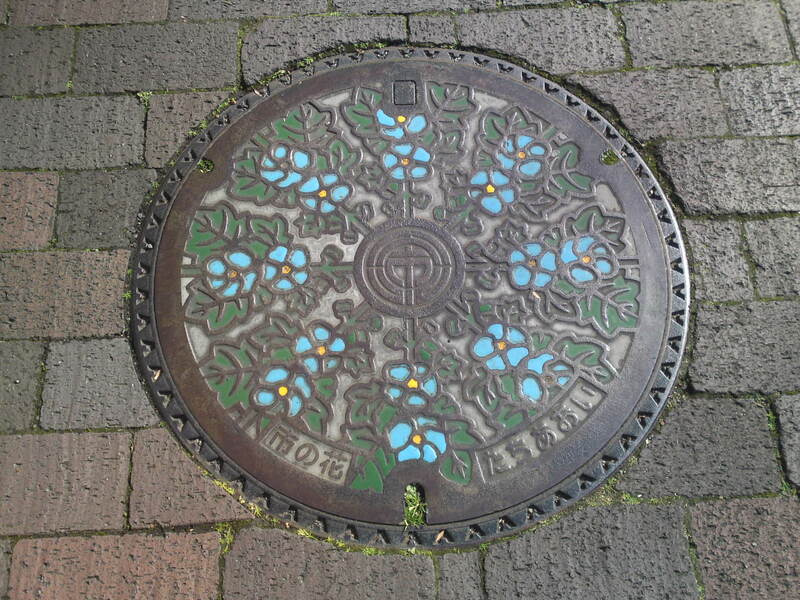 This was met with heated resistance until a more intelligent bureaucrat had the idea of personalizing such manhole covers with designs to promote the cities in charge of their maintenance. 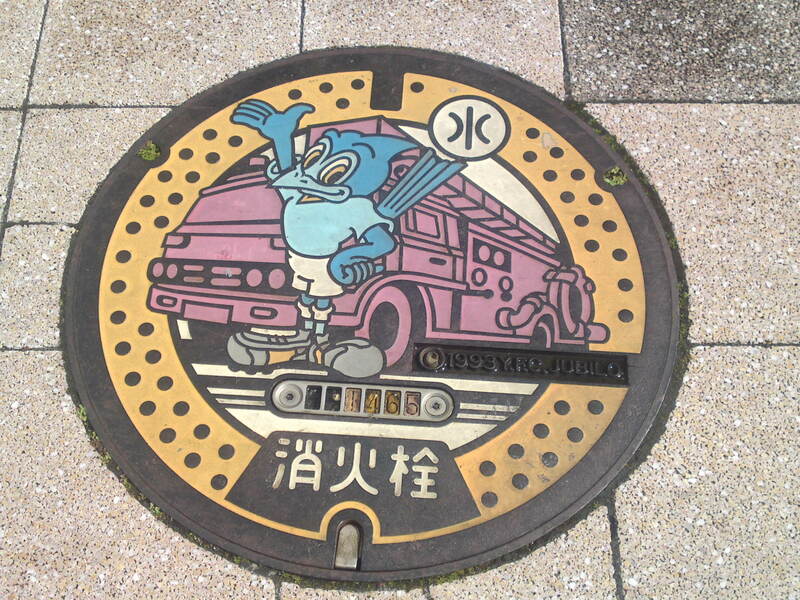 Whereas private manhole covers belonging to electrical supply company in particular had always been there, sewer, water and fire hydrant manhole covers suddenly dotted the pavements and streets of Japan with splendid urban art, the more astonishing for it that it was officially organized by municipalities who devised such designs themselves! 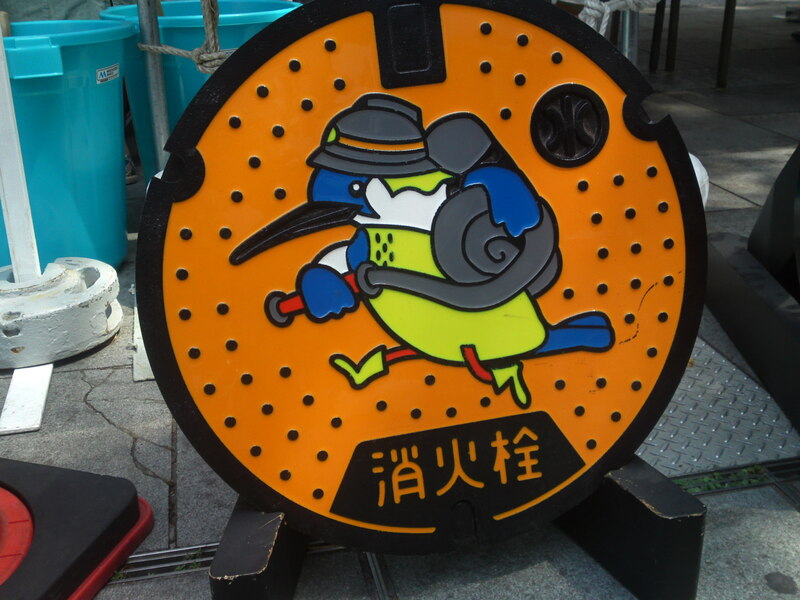 The first soon appeared in Nagoya City to be followed in the whole country. 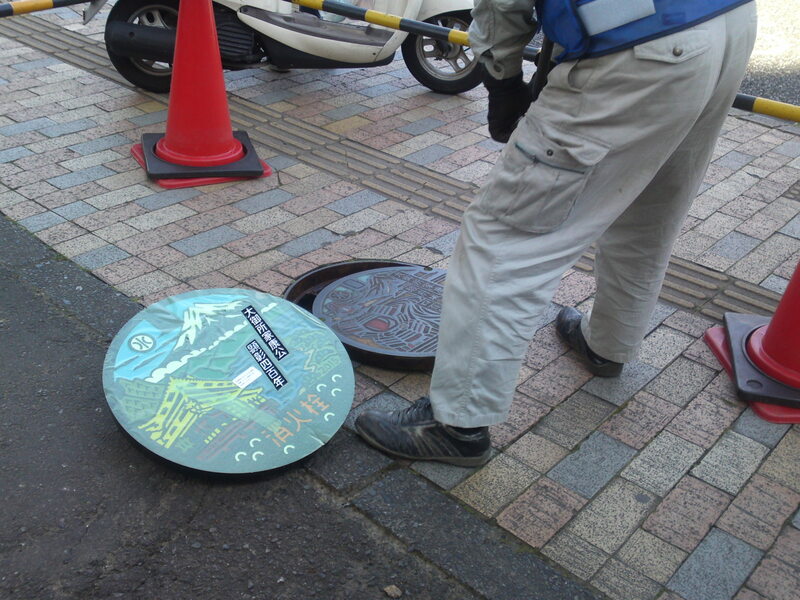 The manhole cover that was never to become public in Shizuoka City! The municipalities sent their designs to foundries who cast such designs into wrought iron, either in neutral color or with bright colors filling the designs thanks to highly resistant compounds. 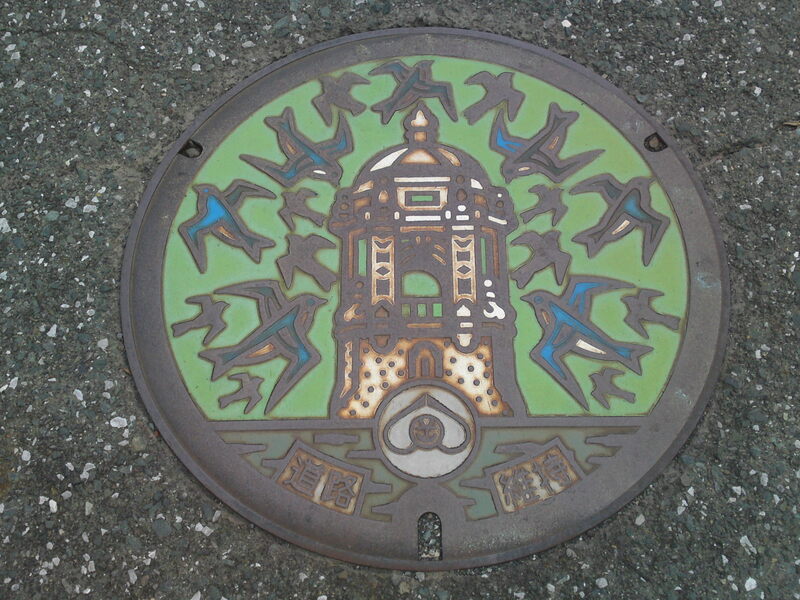 The results are often striking, although errors are still made as proven by the recent mishap encountered with a beautiful design of Shizuoka City’s bird emblem, a kingfisher, for a new fire hydrant manhole cover having to be scrapped when officials realized it would become dangerously slippery under the rain! 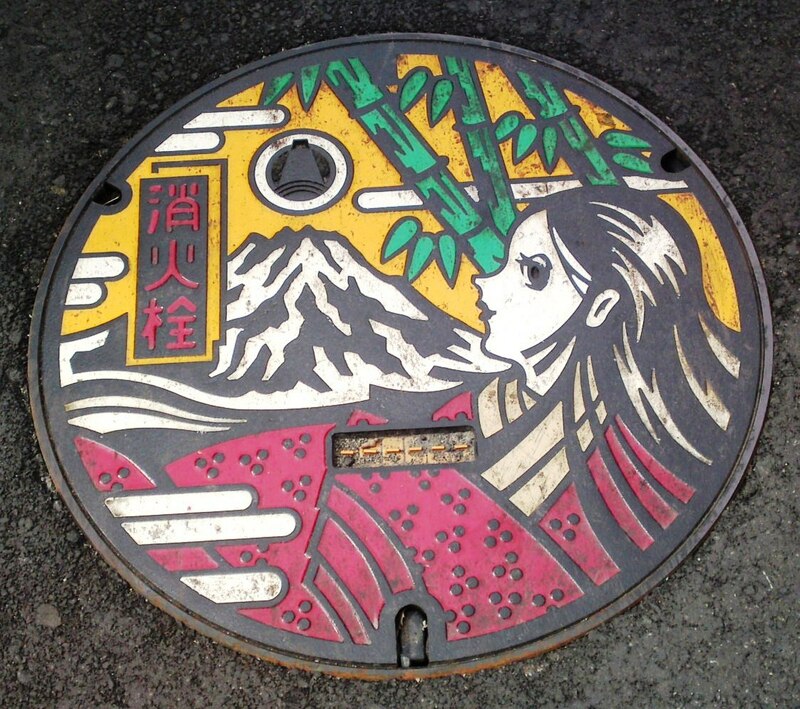 The Legend of the daughter of the bamboo Cutter on a manhole cover in Fuji City, Shizuoka Prefecture, arguably the most popular design in Japan! 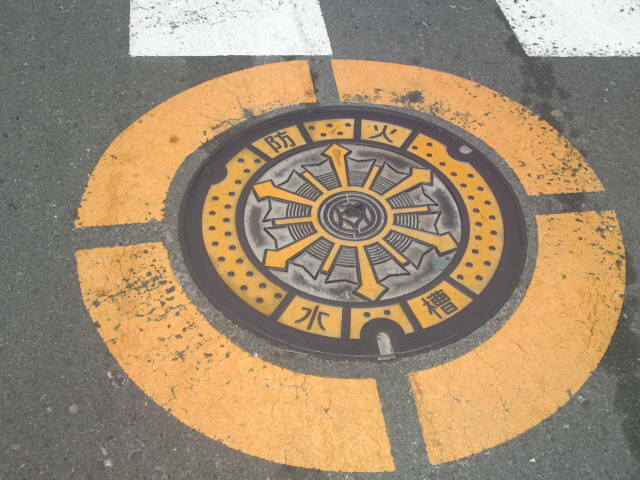 Let me introduce you to a very limited palette (more than 1,700 communities have one or many different manhole covers in Japan!) 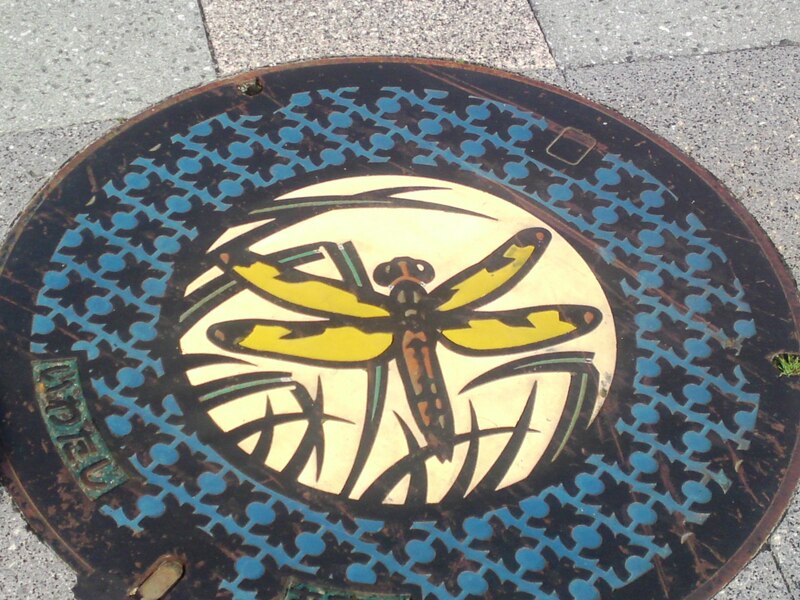 to help you select your own favorite kind of manhole covers! 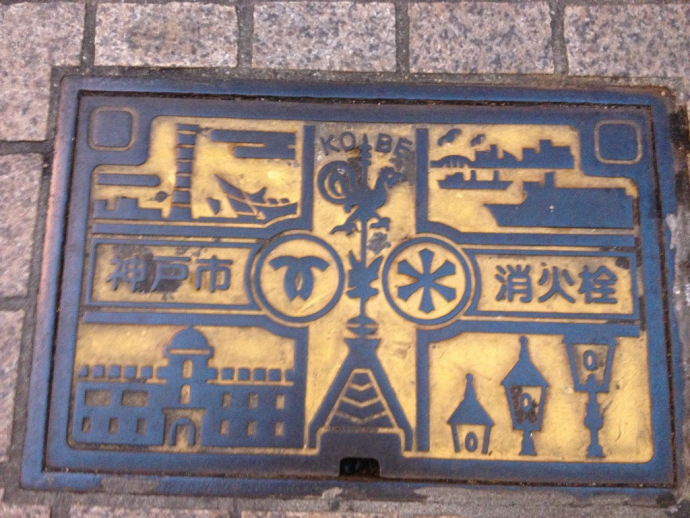 A rare design showing the old Shizuoka Ciy Hall dome on a road maintenance manhole cover! Local and more famous cultural assets under the guise of buildings, bridges, art works, museumsa nd the like will describe the sight not be missed in the places you are visiting! 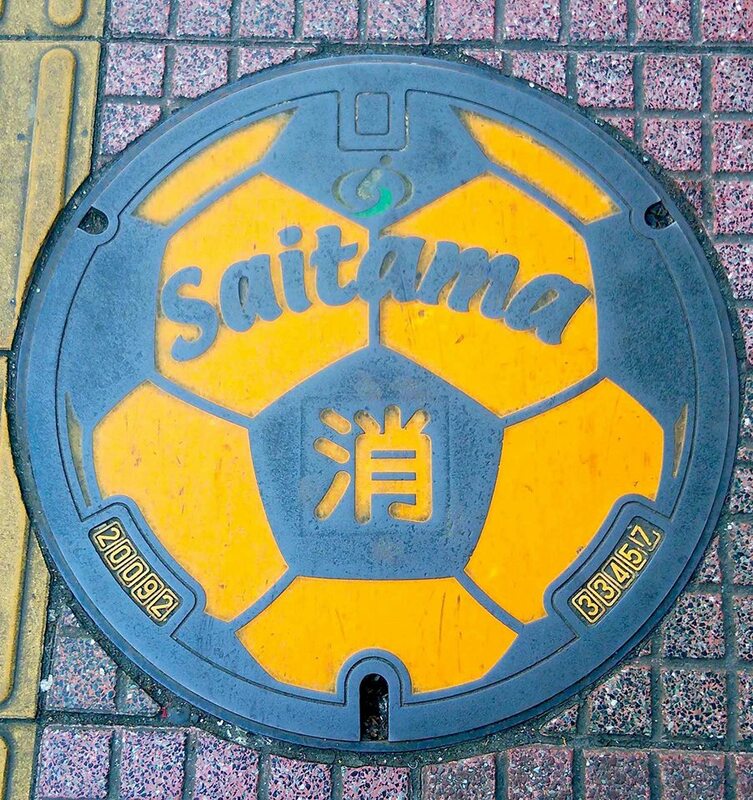 Football (soccer) in Saitama Prefecture! Sports is a very common theme! 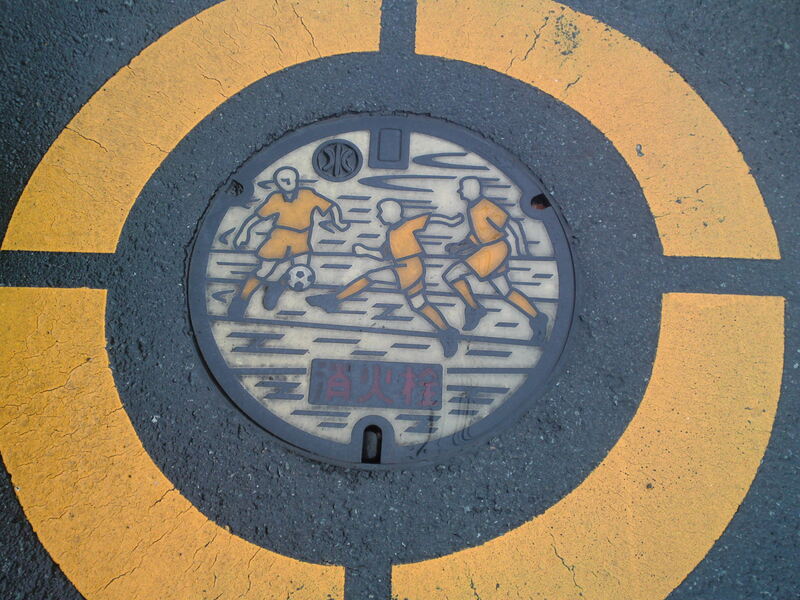 More soccer in Shimizu Ku, Shizuoka City! 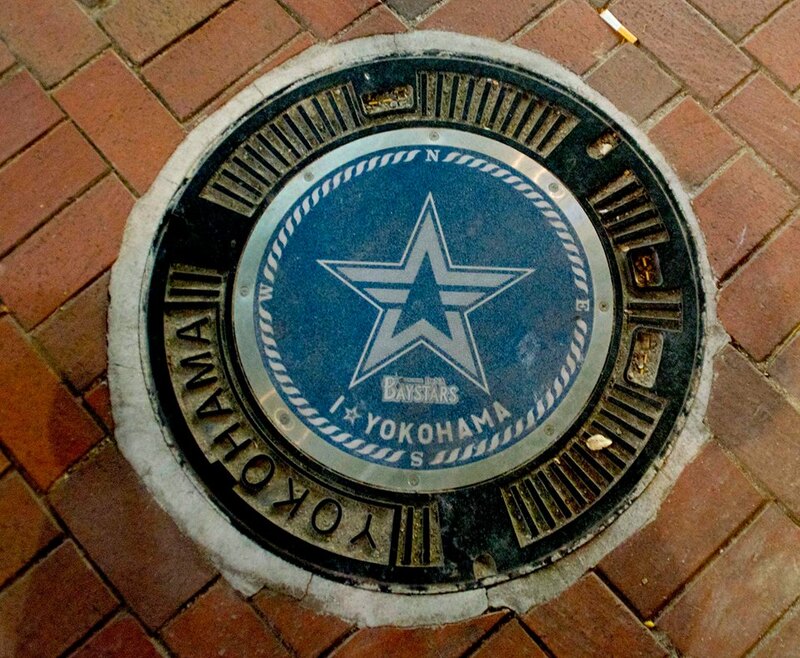 For baseball lovers in Yokohama City! Ecopa Stadium where the World Cup Soccer games were held and where some of the next Rugby World Cup games will be held! Mount Fuji and Miho Matsubara Beach in Shimizu City (now merged into Shizuoka City)! As for Mount Fuji, Shizuoka Prefecture has almost too many of them! A rare (only one!) 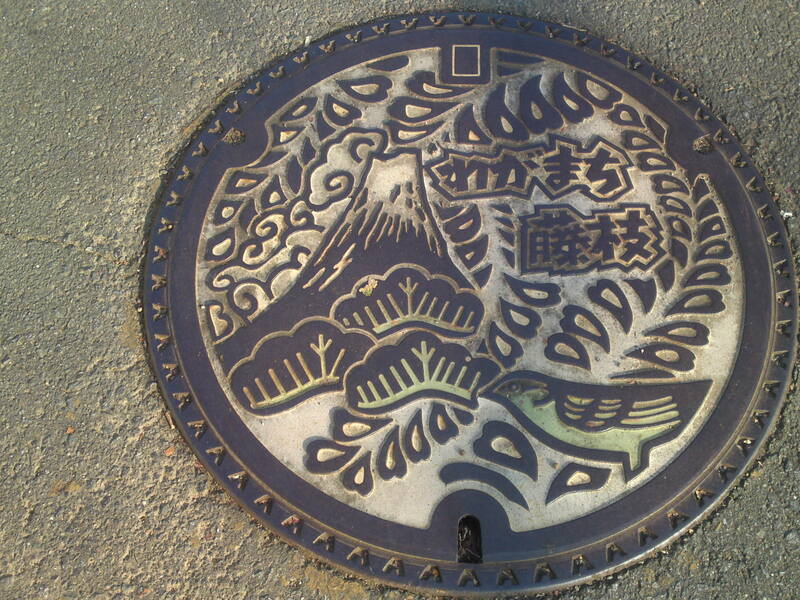 Mount Fuji manhole cover in Yoshiwara, Fuji City, to commemorate a sacred thermal source! This design found in Fujieda City, Shizuoka prefecture, is actually a pun, as “fuji”, albeit written differently, means “wisteria”, hence both Mount Fuji and the wisteria appearing together! Lovers of geometrical designs will have plenty to look around such as the one above in Yui, Shimizu Ku, Shizuoka City! There will be plenty for nature lovers such as this magnificent dragonfly, the emblem of Iwata City in shizuoka Prefecture! There are absolutely too many to count for flower lovers such as the above “tachi aoi/hollyhock” in Shizuoka City! 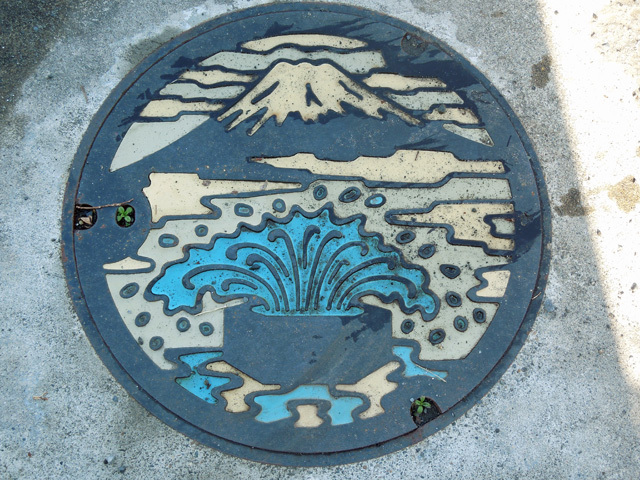 Commemorations will be found everywhere such as this one installed in 2015 in Shizuoka City to commemorate the death of Tokugawa Ieyasu, the Kunozan Toshogu Shrine and the World Cultural Heritage of Mount Fuji and Mho Matsubara Beach! Gastronomy does occupy a special place such as the above katsuo/bonito in Yaizu City, Shizuoka Prefecture! An even better rendition of the same theme in the same city! 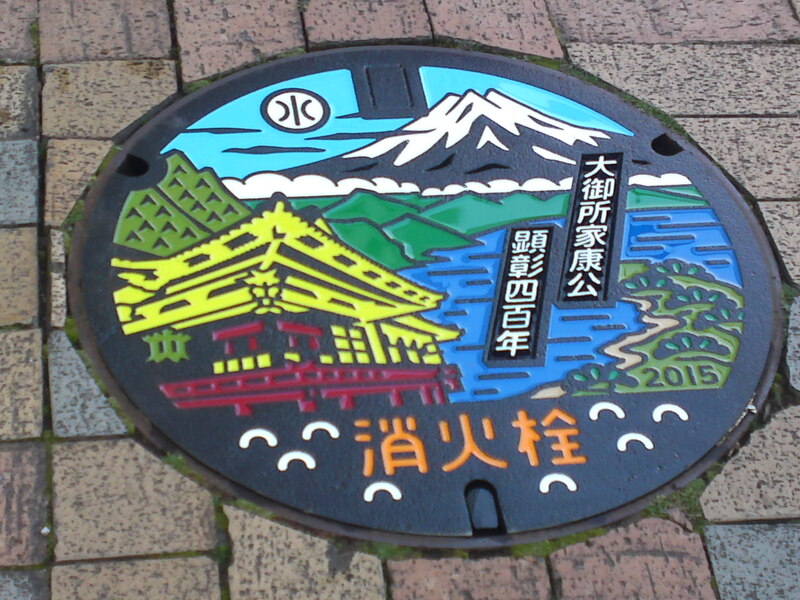 Fire hydrants manhole covers will provide you with plenty of fun as the above in Iwata Ciy, Shizuoka Prefecture! 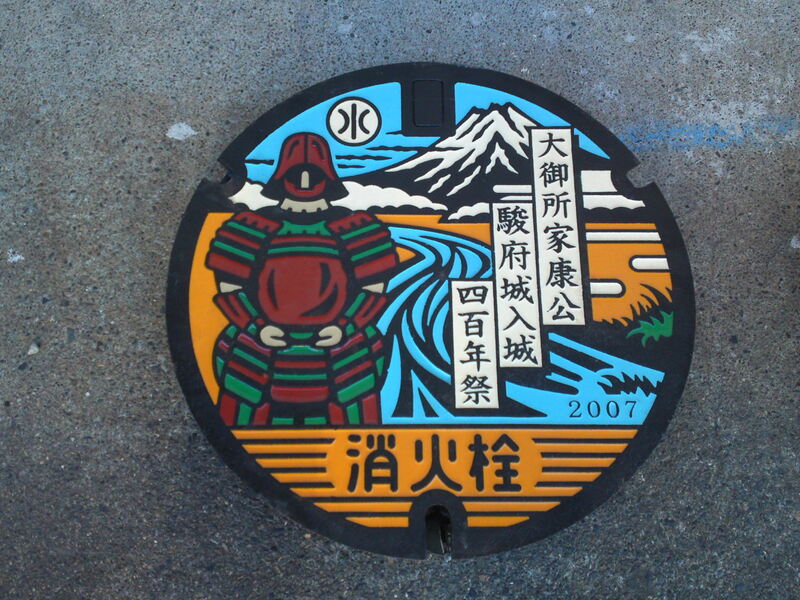 Fire hydrant manhole cover with “Matoi/firemen Festival Pole” in Kambara, Shimizu Ku, Shizuoka City! I’ll conclude with Lord Tokugawa Ieyasu who retired to Sumpu, presently Shizuoka City in 1607! Previous PostLunch Box: Ikawa Mempa Bento Boxes by Artist Craftsman Yoshiaki Mochizuki!Next PostCherry Blossoms in and around Sumpu Castle in Shizuoka City!